Access preplanned calendars or quickly search over 16,000 activities to build your own. Save one hour or more per day in lesson prep and planning time, per teacher! Flexible, easy-to-use lesson plans that you can access anywhere, 24 hours a day, from any device. Customize your lesson plans to fit the needs of your classroom. One Bible story per month with 35+ activities. Non-denominational. 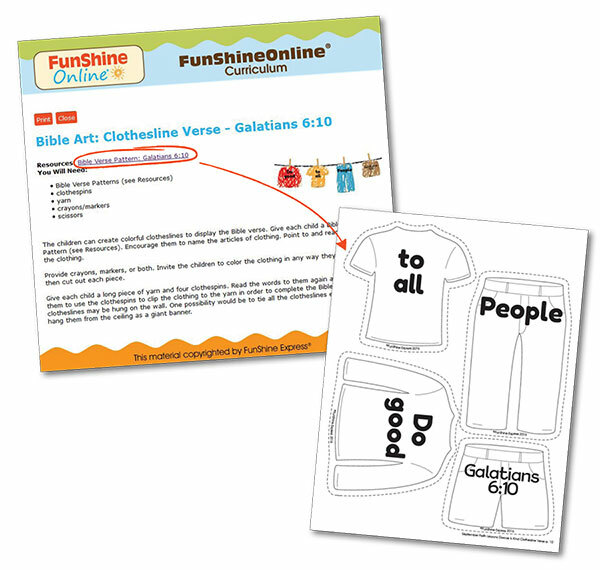 Downloadable resources including Bible verse, practice page, Rebus activity, and more. Click and drag to rearrange activities, and edit activities to customize your Christian experience! 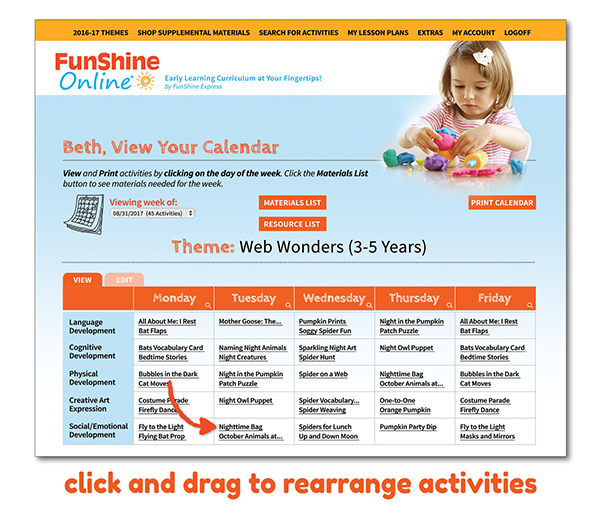 Do I need any special programs, software, or devices to access FunShine Digital lesson plans? Use a desktop, laptop, or tablet to search for activities and build calendars. The screen size on most smart phones makes it difficult to build an entire calendar efficiently. We recommend building your calendars using a desktop, laptop, or tablet. If you simply want to view the activities for a certain day on your Calendar, you may use a tablet or smart phone. Adobe Reader - Open PDF files, such as activity and lesson plan previews, and weekly materials list. Get a free copy by clicking here. Enable popups from FunShine Digital - Anytime you click a link, open a Resource, etc., it will open as a separate page (popup) and will not take you away from your FunShine Digital account. Will my subscription automatically renew? Can I pause or cancel my subscription? Yes, the subscription will renew on the same day each month. You can cancel, pause, and restart your subscription at any time. Refunds are not issued for canceled subscriptions, however access to lesson plans is granted through the paid month. How many subscriptions do I need and how many children can I have per subscription? Each teacher/provider needs their own subscription, whether teaching one child or ten children. After subscribing, you choose the lesson plans for the age group of the children in your care, 0-3 years or 3-5 years old. If you have five caregivers in your setting, then five subscriptions will need to be purchased. 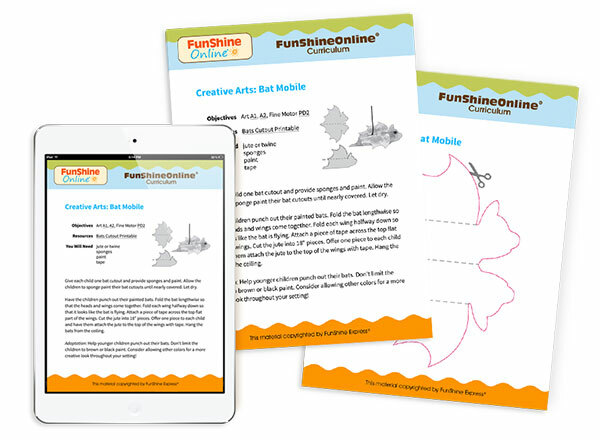 All of the FunShine Digital resources and lesson plans are copyrighted material. We grant teachers permission to print the resource pages from this website for individual classroom use only. This website may not be reproduced in whole or in part, or stored in a retrieval system, or transmitted in any form or by any means electronic or mechanical, photocopied, recorded, or otherwise without written permission of the publisher. Sharing or reproducing this website, resources, or daily lesson plans for an entire daycare center or for more than one teacher is prohibited. Copyright infringement is a violation of federal law. Each week the ready-to-use theme provides a well-rounded set of activities focusing on language development, social/emotional development, creative arts, cognitive development, physical development, and multiple approaches to learning. You can view sample activities from each theme here. Are multi-age groups supported by Digital lesson plans? Yes! Each paid subscription chooses ready-to-use lesson plans for infants/toddlers (age 0-36 months), or preschoolers (ages 3-5 years). Our searchable database of thousands of activities lets you customize or build your own lesson plans. Many of our activities in each age group provide scaffolding and extensions so that activities can be easily modified to accommodate younger or older children. You can also create a multi-age lesson plan - visit our tutorials to learn more. What kind of supplies do I need to provide? Most of the art activities in our curriculum have been created with simplicity of gathering resources in mind. If you don't have one of the supplies on hand, simply substitute another supply to fill the need. For example, if you don't have wiggle eyes, simply draw eyes using a black marker OR cut two small circles from white paper, draw a black dot in the center of each circle, and glue the eyes on the project. Once you have built your lesson plans, select the Materials List button to view and print the materials you will need for that week. We also have a general list of materials. Please be advised that not all materials may be appropriate for ages 0 through 5. Use caution when storing all supplies. Parents are a valuable resource in any classroom! Invite them to help you gather materials for your environment by sending home our downloadable Wish List. Can I find activities that involve a specific skill my children need to work on? Yes! Use our searchable database to find activities based on letters, numbers, colors, shapes, skills, or even keywords. Simply click the Search for Activities button, choose the Age Range and any other filters you would like, enter a keyword into the Search box, and click Find. Activities will be displayed in the Search Results area. Keep in mind that sometimes a keyword may have more than one meaning, so all results may not be exactly what you are looking for. Do I have to print everything? No! We designed the curriculum so you don't have to print! We suggest building your calendars on computers or tablets. You can access and use the calendars on computers, tablets, and even smart phones. This means there is no need to print weekly lesson plans! Buttercups and Fireflies Teacher Packs include all of the printed resources each month, which FunShine Digital subscribers can receive at a discount! You may choose whether to print the Materials List for the week to help you gather supplies. It’s up to you! We suggest printing and saving some materials for later use. If it's an item you can print or display on an electronic device, we let you know. Use your electronic device like a picture viewer. You can click on a link to a resource within an activity to show the resource on your screen. Order printed, full-color Teacher Packs with materials needed for each theme. If you do choose to print, your current browser settings may not allow you to print by simply clicking the Print button. From the Calendar view, click the day of the week for the lesson plans you would like to print. This will open your Lesson Plan Preview. Once the Preview is open, press the CTRL and P keys (or Command Shift P keys on Macintosh). This is the shortcut for Print on your computer. Your document may then print, or you may have your printer software set up to provide a popup so that you can choose a printer or adjust print settings. Proceed as normal from the popup and your lesson plans will print. To save printer ink: choose Draft Quality in your print settings. This will speed up the printing process and use less ink. You can also choose to print your materials in gray-scale to save on color ink. Click HERE to learn more about selecting print size for documents.